Many of you may have gotten an e-mail last week talking about cold injury. I have also been getting calls about delayed development in certain crop fields. This is a quote from Paul Hildebrand - "Earlier this week Willy travelled to Westchester Mountain and he noticed poor foliage development in some fields. This is due to the cold nights we had around April 30. 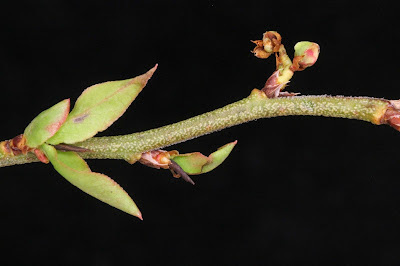 The growing point in the vegetative bud is blackened and only a few leaves per leaf shoot develop. 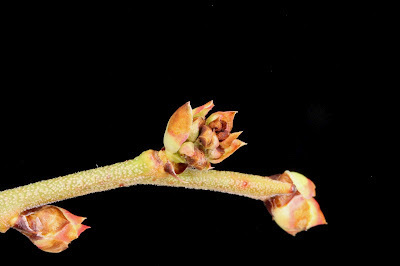 Also, flower buds are stunted and/or are turning brown. These symptoms are not due to Monilinia blight. We are not sure how wide spread this problem is, but it likely will affect yields in some fields. Apple growers have reported injury in the Valley as well." We are starting to see some monilinia blight out there but the cold weather symptoms look quite different. Take a look at a pictures Paul Hildebrand sent and the post I made yesterday on the blog to compare.